As a young man growing up near Basel, Jung was fascinated and disturbed by tales of Nietzsches brilliance, eccentricity, and eventual decline into permanent psychosis. 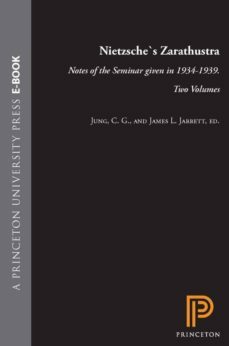 These volumes, the transcript of a previously unpublished private seminar, reveal the fruits of his initial curiosity: Nietzsches works, which he read as a student at the University of Basel, had moved him profoundly and had a lifelong influence on his thought. During the sessions the mature Jung spoke informally to members of his inner circle about a thinker whose works had not only overwhelmed him with the depth of their understanding of human nature but also provided the philosophical sources of many of his own psychological and metapsychological ideas. Above all, he demonstrated how the remarkable book Thus Spake Zarathustra illustrates both Nietzsches genius and his neurotic and prepsychotic tendencies.Since there was at that time no thought of the seminar notes being published, Jung felt free to joke, to lash out at people and events that irritated or angered him, and to comment unreservedly on political, economic, and other public concerns of the time. This seminar and others, including the one recorded in Dream Analysis, were given in English in Zurich during the 1920s and 1930s.